What is the most rewarding part of playing Magic the Gathering for you? For some it is the gameplay and for others competition. For many it is just something to play casually with friends. 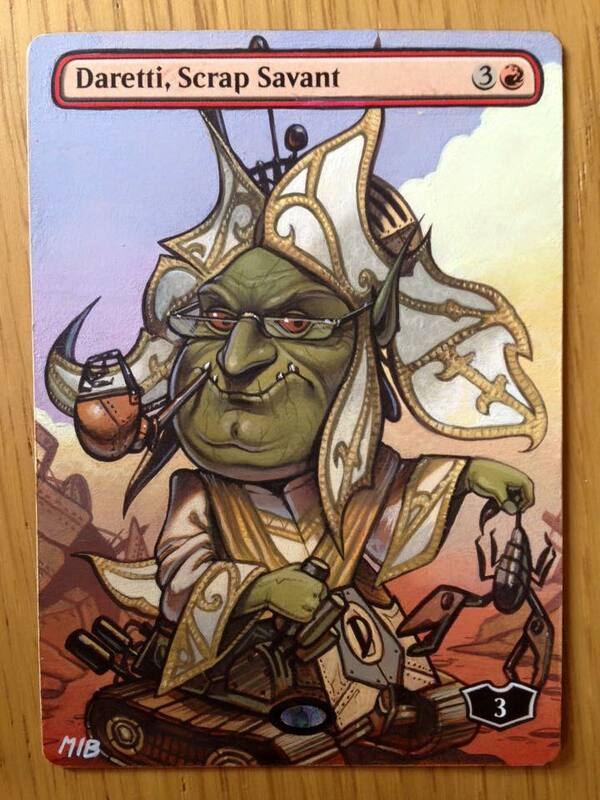 For others, their favorite aspect of paying Magic the Gathering is customizing their cards. Finding unique and fun ways for everyone to enjoy Magic is something the game itself strives to do. Creating a welcoming environment where players are free to express themselves explains the need for so many different formats and variations of cards. Having your card stand out from the pack is something many players desire when playing Magic. Some players find foils a great way to do this, and will go out of their way to find premium versions to spice up their decks. For some people, misprints are their preferred method of standing out. Misprints occur where something happened in the actual physical manufacturing of the card itself causing an abnormality to occur. For others, alters are the way they choose to cultivate their creativity. Today, I will be discussing some of my favorite MTG alterists at the moment and some of their alters that have really caught my eye. It may come as a surprise to some, but there is actually a massive online card altering market. Ebay, Etsy, and Facebook have provided successful social media outlets to display your artwork and players have been devouring it. The desire to have your cards customized by not just top notch alterists but even small, lesser known alterists, is ever-growing. I do not purchase many alters myself because all my allotted MTG money is spent on foils and artwork, but I do absolutely have some favorites. Eric has been in the altering business for almost a decade and he is at the top of his class when it comes to producing high quality alters. I figure most people reading this have heard of him before and even purchased an alter from him. Here are a few of my favorites of his. I love Klug’s alter on the most powerful spell ever printed, Black Lotus. His ability to replicate Terese Nielsen’s gorgeous Guru land style is superb. 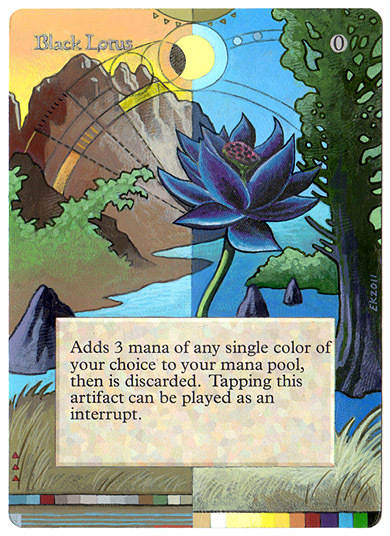 This full-art alter that covers the entirety of the border, yet somehow doesn’t take away from the allure of the lotus itself. 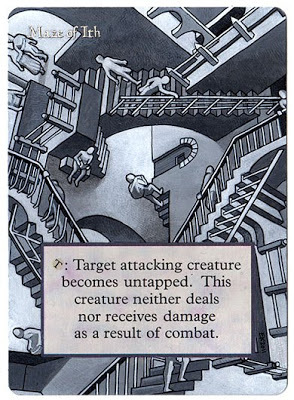 This MC Escher inspired Maze of Ith is one of Klug’s most famous alters. The line-work is amazing and I can’t even imagine how beautiful it looks on the battlefield. This is one of Klug’s most recent masterpieces. I absolutely love Damnation and Gustave Dore so this alter hits me in all the right ways. I absolutely love this alterist’s way of blending real world items into their pieces. I absolutely LOVE alters that take a spin on what the card does. 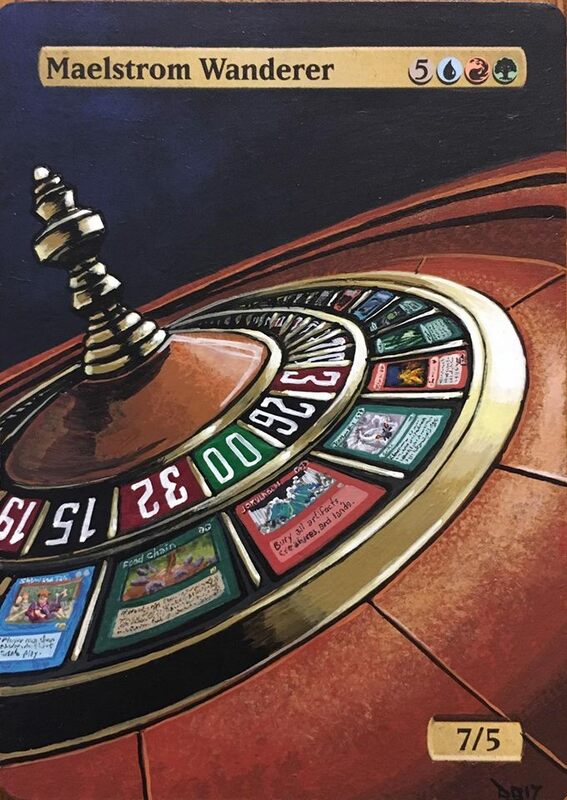 Casting Maelstrom Wanderer in Commander is always a spin of the wheel and the images on the roulette wheel certainly represent some sweet hits. Can you name them all? Ok, admit it. 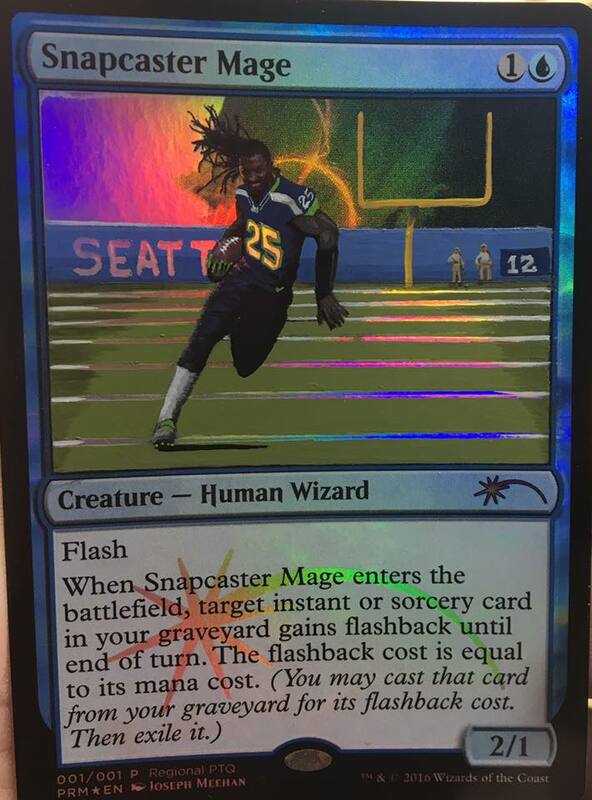 We ALL thought that that promo Snapcaster Mage looked like a soccer player. This is a brilliant execution of that concept and I love how the lines on the field and the number 25 on the shirt look like the foiling process itself. You know an alter is top notch when you confuse it with a photograph. I cannot get over how realistic the casino chips look on this Mox Emerald. Masterful shadowing and scale. 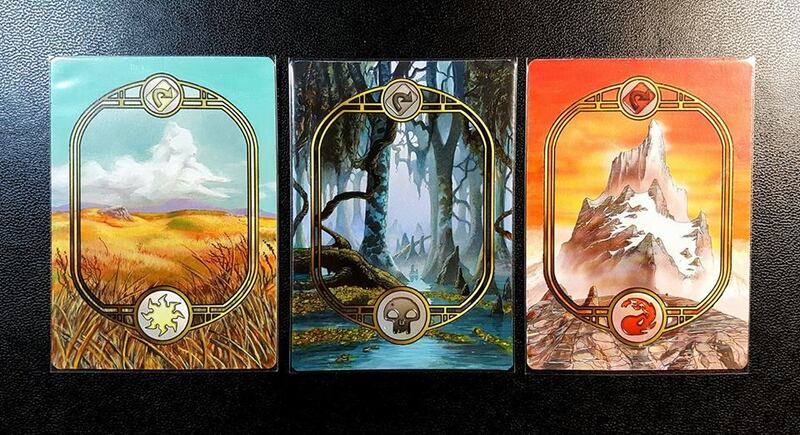 This alterist makes the list for their masterful border extensions and full-art re imaginings. I absolutely love these Unglued basics because the colors really pop and you can’t tell where the original artist’s work ends and where the alter begins. 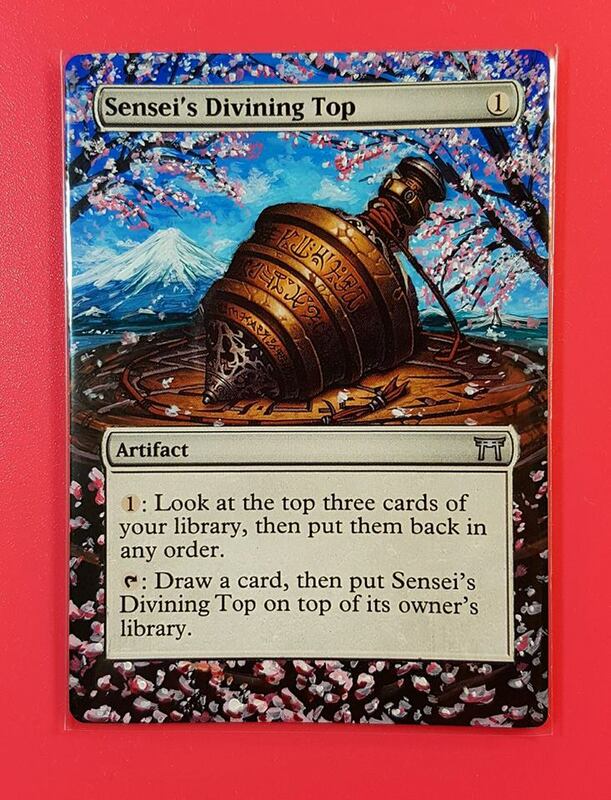 Ooo I love me some cherry blossoms and I absolutely love how this alter uses the Japanese influence to compliment the top. It doesn’t overdo it, which is an important thing to consider. 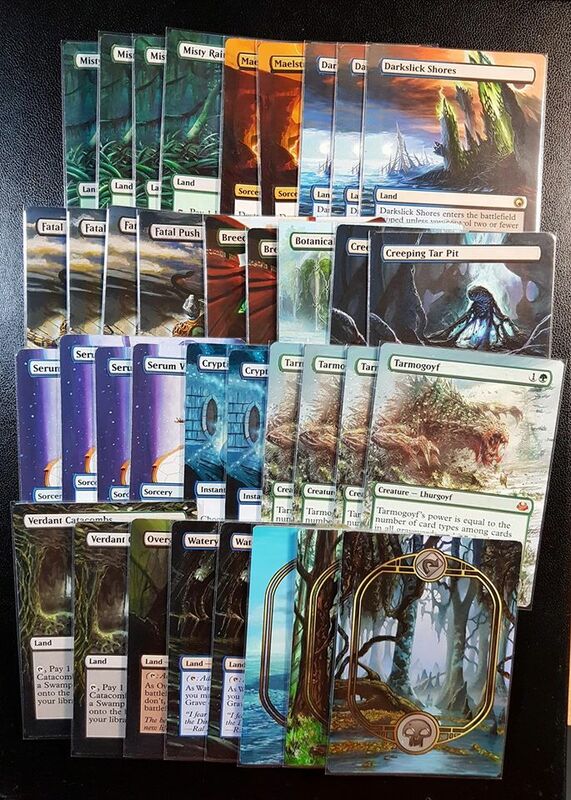 Ok someone is gonna have a sickkk looking Modern deck here. Hard to pick which my favorite here is because of how the picture is taken, but I love how they all work together. The colors are great and the cards are easily recognizable. Sandreline has many different styles and each of them is masterfully done. I can never tell right off the bat when a piece is done by her but if it catches my eye and is beautifully done, I am never surprised it was painted by her. Those lions look super realistic and majestic. 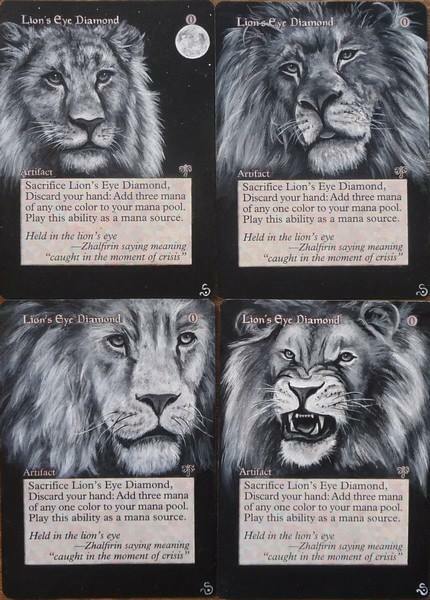 It’s easy to forget that these are on Magic cards, they are so well done. I absolutely love the black and white aspect here too. 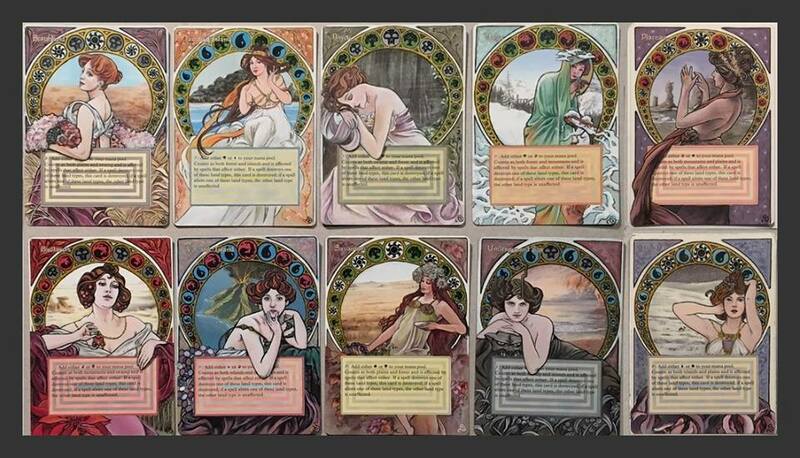 These art nouveau inspired duals and very popular alters by both Sandreline and Eric Klug. I think they are unique and interesting, even if I do prefer clean Fbb’s myself. 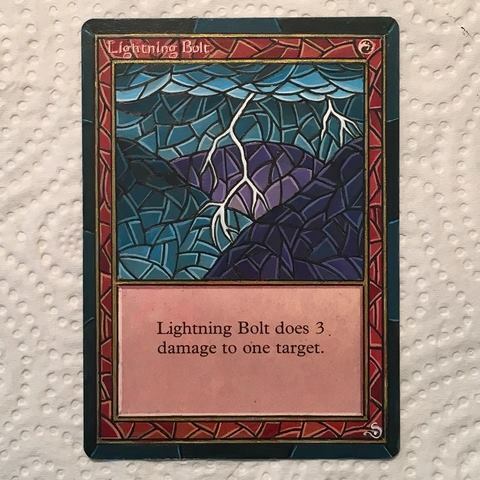 Stained glass Lightning Bolt?! Be still my fiery heart! I absolutely love all her stained glass alters but this one takes the cake for me. Talk about a sweet idea for a future Masterpiece series. 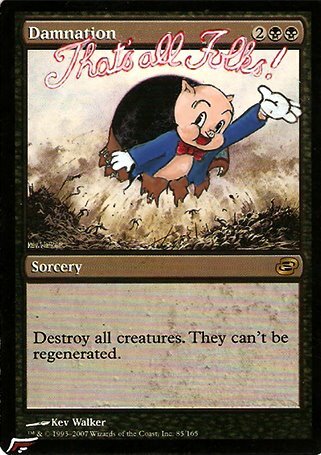 I’m not gonna lie, I absolutely had MIB alters as my number 1 pick for favorite MTG alterist by a landslide. 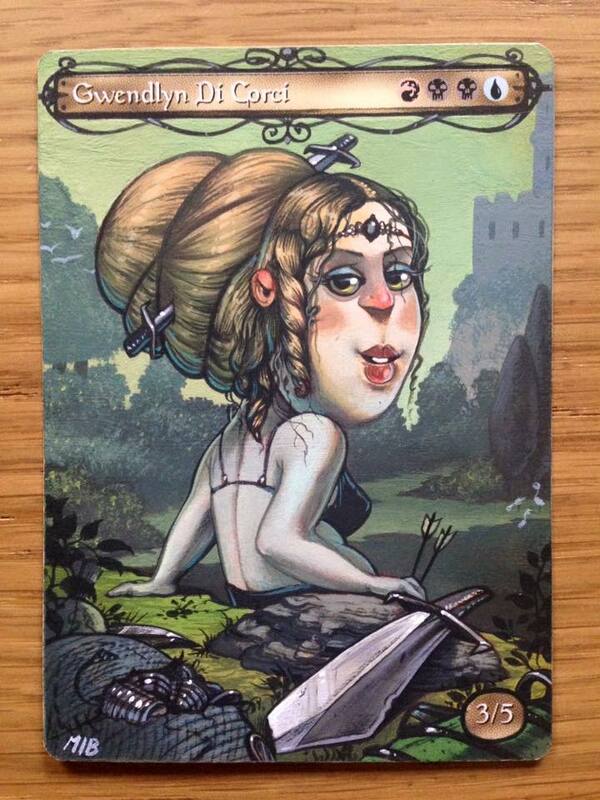 I absolutely adore their style to no end and cannot get enough of seeing each of these amazing alters. I would KILL to own one someday. I absolutely love this art style and it is so unique to MIB alters. 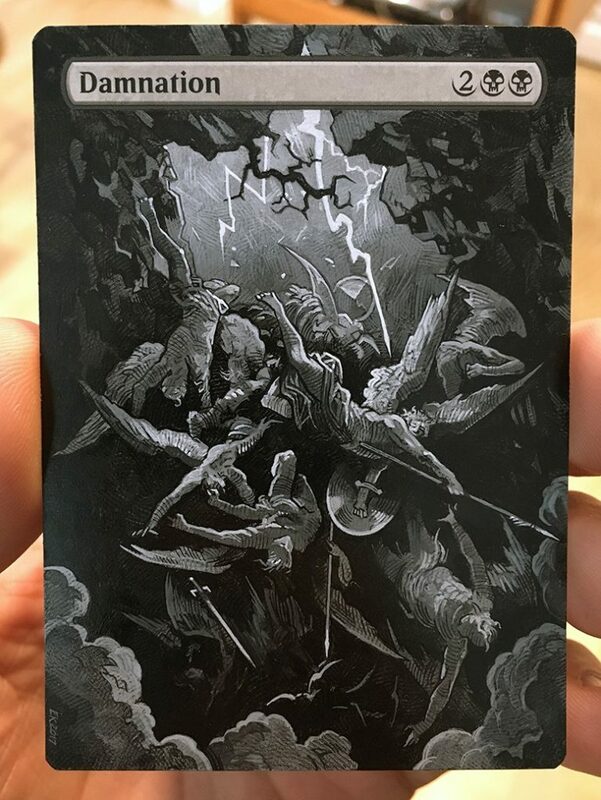 I can instantly tell who illustrated it and its uniqueness even among alters really strikes me. I love this Daretti because of his facial expression. I just screams curious mischief to me. The colors here are absolutely breathtaking and the facial expression is both natural and cartoony at the same time. I don’t know how that’s even possible. All hail Phyrexia! 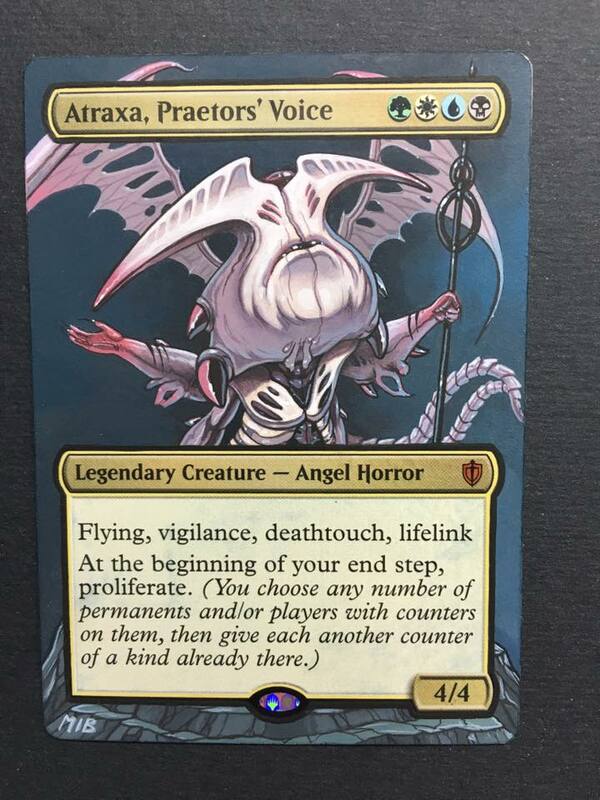 Praise to Atraxa our overlord and long may her reign be! Okay, this artwork captures an adorable Atraxa, which isn’t easy to do while still keeping some of her menacing features. An absolute home run, and alters like this are what keep me coming back to MIB for inspiration. I hope you enjoyed checking out some sweet alters with me. There are so many amazing alterists and alters that I didn’t get to mention here. I truly respect all forms of this art and do recommend purchasing at least one alter in your life, even if you just use the card casually. Who are your favorite alterists? Do you have a favorite alter that you own? Let me know in the comments and thank you for reading! Congratulations on your new writing job on ChannelFireball! Do you plan to spend most of your time there, or on this site? As someone who once wrote for multiple sites, it can be rather daunting to try to fulfill the demands of both. Hello! I am currently writing for THREE websites, not just two and I foresee writing for all three at least for the time being. Oooh, best of luck to you on that. Nice to know you are super passionate on your writing to undertake this. I am super passionate about MTG in general. Writing about it only seemed natural even if I don’t have a huge knack for writing. 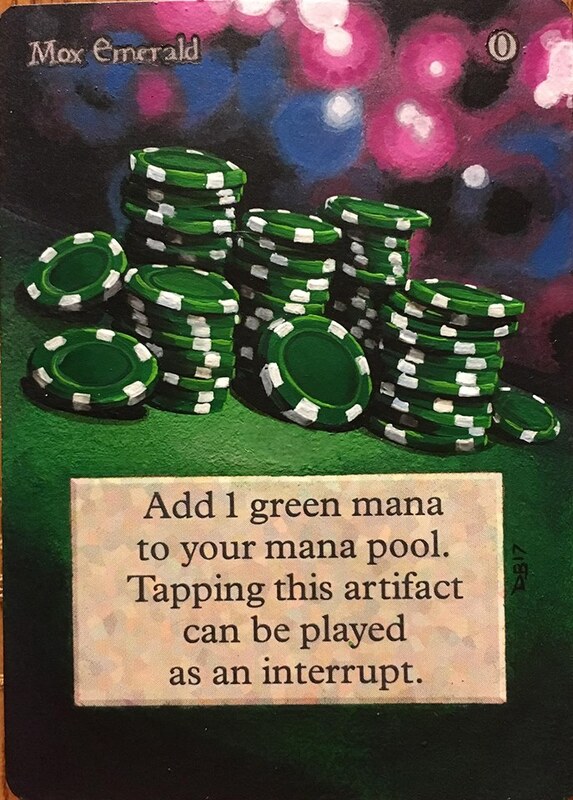 Sounds silly but one of my favorite alters is simple yet classy. Disneys Aladdin on an Arabian nights Aladdin, lol. I’ll try to get you a pic. I’d LOVE to see a Lucio inspired RPTQ Snapcaster. I might have to make that happen. That is awesome I would love to see it! Altering the new slivers to their old aesthetic made my EDH and Legacy decks far more slithery. Was a great decision. ScourgeAlters helped me out. That is awesome. Would love to see a picture! Finally an open gate! Always keep the pet dogs downstairs.